Once again, the foreign policy baffoonery of the Barack/Hillary team has come back to bite the West; the Obama administration’s diabolical duplicity in the Middle East is the gift that keeps on giving. In its shortsighted, or most-likely intentional, destabilization of the Middle East through the so-called ‘Arab Spring’, which in reality gave control of portions of North Africa to the Muslim Brotherhood, a Jihadist terror umbrella organization, Obama removed dictators which kept the Islamist threat at bay. A perfect example of this phenomenon is what happened in Libya. Muammar Gaddafi was a Libyan strong man who had just given up his budding nuclear arsenal to the West after the Bush invasion of Iraq, in hopes of maintaining power and preventing the same thing happening to him that happened to Saddam Hussein. Barack and Hillary had better ideas and famously deposed Qaddafi, and saw him murdered, in the period that gave us the Benghazi incident and the deaths of four good Americans. “We came, we saw, he died!” Hillary creepily declared during an interview after the incident. It turns out it makes a whole lot of difference, for now we have a full-blown civil war where rebel forces are advancing on the Western-backed government in Tripoli. In all likelihood, Russia and China are looking to take full advantage of this situation to establish another foothold on the Mediterranean and threaten NATO’s soft underbelly. The rebel Libyan National Army (LNA) commanded by General Khalifa Haftar has just declared to have taken the airport in Tripoli. “I leave Libya with a heavy heart and deeply concerned. I still hope it is possible to avoid a bloody confrontation in and around Tripoli,” U.N. head Antonio Guterres said on Twitter. “The U.N. is committed to facilitating a political solution and, whatever happens, the U.N. is committed to supporting the Libyan people,” reported Reuters. You can read the latest on the ongoing battles for control of Libya here in this piece from Reuters. 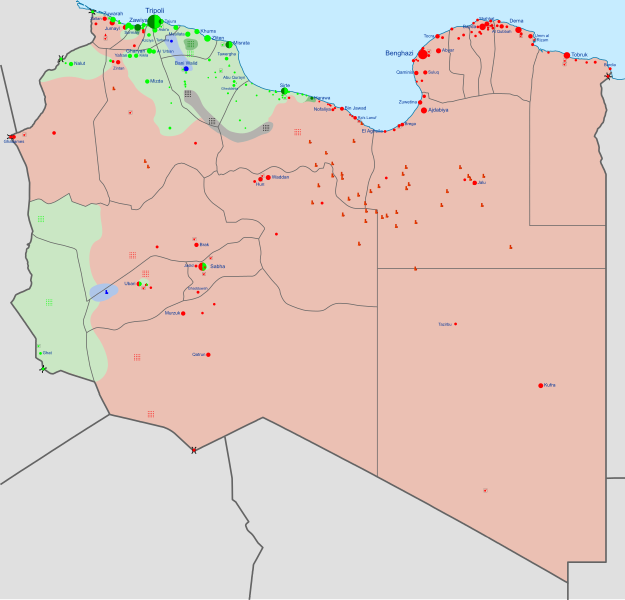 For its part, Russia is playing the role of statesman, looking down on the foolish fighting, when in reality Moscow is most likely supporting Haftar and believes it will have influence in Libya once he controls the entire country — which means a Russian naval facility across from Italy. We are watching the developments in Libya very closely,” Kremlin spokesman Peskov stressed, reported Russian state news agency TASS. Belying these denials is reporting that Moscow has been heavily involved with Haftar all along. See Tsarizm’s reporting below.